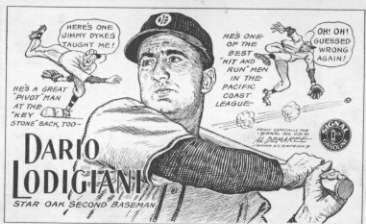 Born in San Francisco, California, on June 6, 1916, of Italian descent, dandy Dario Lodigiani, 31, is playing a return engagement with the Acorns this year. He was with the Emeryville nine in the 30's. "Lodi" infielded for the Philadelphia Athletics in � and for the Chicago White Sox from � to �. He socked a mighty .395 for the Oaks before going to the majors. Attending Galileo High School in San Francisco he made all-star teams in baseball, basketball and football. 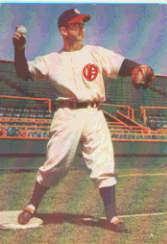 He started professional baseball with the Oaks in 1935 and went to Philadelphia in 1938, staying with the major league clubs until 1946 when he returned to Oakland. Hunting, fishing and golf are his hobbies. He takes it easy in the winter. Was in the Army Air Corps in 1933-44-45. A fine ball player and a gentleman.